The Larson Electronics EPL-WPMH-175 Hazardous Location Wall Pack Flood Light is designed for maximum efficiency with a 175 watt metal halide bulb for high output and long life. This unit has a baked on bronze finish for a rugged yet attractive design and is Class 1 Division 2 rated. Designed as a wall pack light, this hazardous location 175 Watt metal halide light features a self hinged door secured by captive fasteners that provides easy access to the lamp and wiring components for servicing and maintenance. 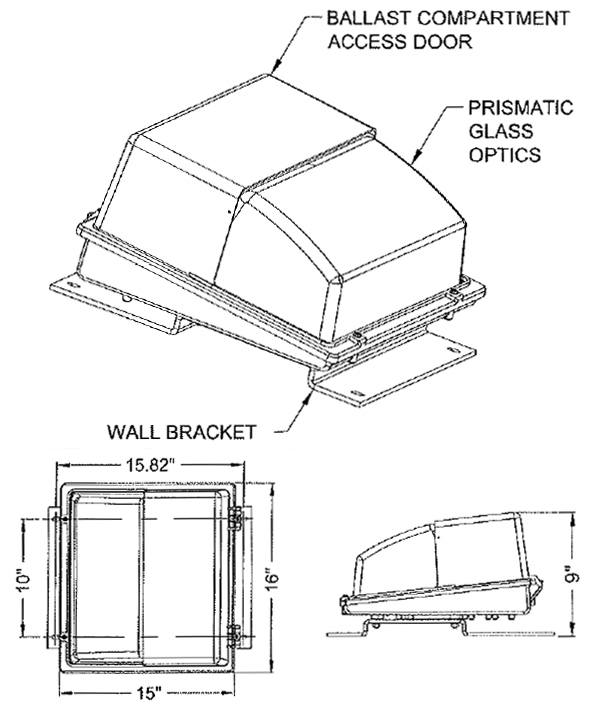 This explosion proof wall pack light is equipped with two 1/2" conduit entries and a 1/2" rear knockout which allows entry to the rear of the fixture for through wall wiring. This metal halide wall pack light has an integral ballast that is sealed within the fixture housing and is available in 120 VAC to 277 VAC on 50/60Hz configurations. The EPL-WPMH-175 maximizes light output with a contoured anodized aluminum reflector assembly that provides durability and maximum efficiency. The lens is made of a prismatic tempered glass which reduces glare and provides a soft diffused light output. This HID wall pack light is both thermal shock and impact resistant and the lamp socket and ballast are pre-wired in the factory and tested before shipped. These units are Class 1 Division 2 approved and CSA LR25428 approved for hazardous locations and ideal for industrial and commercial applications where flammable gases, vapors and dusts may occasionally be present.